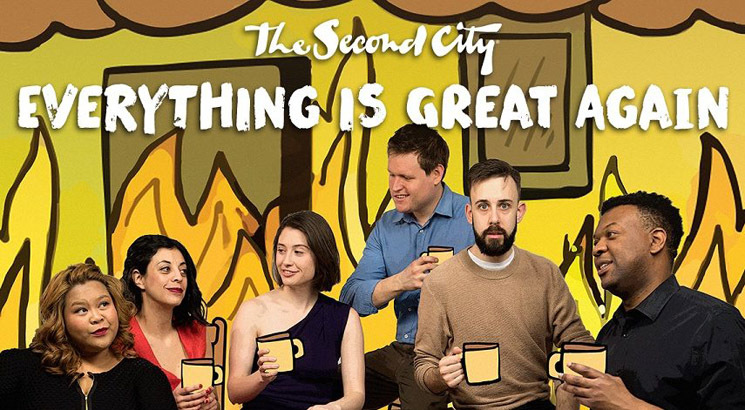 Everything Is Great Again definitely has moments of greatness, but there are a few too many moments that are more about making the audience say "I see what you did there" than making them laugh. It's worth seeing for amazing performances from Brandon Hackett and Ann Pornel, but for the most part, it's not a show you'll be talking about for days. Hackett delivered one of the most original and hilarious moments of the show as a character who thought that talking about his "bewigged dog" was a valuable contribution to a discussion about free speech. He also stood out as a drama queen in a commercial featuring "real people, not actors," and as a guy at a meditation retreat who had an existential crisis as he realized he was out of touch with his culture. Likewise, Pornel was incredible in the meditation retreat scene as she screamed in exasperation "I don't even know how to spell the Philippines… HOW MANY P's?!?!?". Her joy for performing was contagious, especially when she showed her quick wit in an improv scene, and when she lead some Beyoncé-backed choreography with her fellow Second City cast members. Aside from a sketch where Colin Munch brilliantly impersonated all the sea creatures at Ripley's Aquarium in rapid succession, the scenes that starred the rest of the cast were unexceptional. Devon Hyland's improvised dialogue about a song titled "Scale A Fish" felt more like someone thinking out loud than sharp improv, and it was accordingly met with more applause than laughs. Paloma Nunez showed great dedication to her characters, but often started off with top-level energy and left no room to build. Whether she was an aunt telling horror stories about having children or a loud flamenco guitar-playing man with an amusingly fake moustache, her performances started as comically melodramatic but became predictable. Lastly, Lindsay Mullan and Colin Munch were the focus of a few bits that solely succeeded because they pandered to people's frustration with two universal things: Tinder and Trump. Mullan's painful regret about accidentally swiping left on someone attractive was entertaining, but by that point in the show, overdramatizing had become so commonplace that it was mediocre. As for the scene that featured Colin Munch yelling in bewilderment about U.S. politics, there has never been a sketch that was so clearly made to elicit what Seth Meyers calls "clapter": clapping in agreement with a smart political opinion, but no actual laughing.